Nick Fischer (Roosters\/Bikers Edge) launches off the smaller log on his way to a top 15 finish at UTCX # 4 Weber County Fairgrounds. Photos: Chris See. Find more at fredmarx.photoshelter.com. Alex Grant took advantage of a late season surge – and the absence of two of his top competitors – to claim the season title in the Men’s A division by just three points over Park City youngster Keegan Swenson. Grant’s 666 points came after consistent showings over the last half of the season. The Cannondale Factory Racing teammates held off Jason Sager (Jamis) who finished the season in third place – only nine points away from first. Contender Bicycles’ Reed Wycoff wasn’t far behind and finished just off the podium with 653 points while Echelon Energy’s Troy Heithecker rounded out the top five with 647 points. The Men’s A was far from the only field to have down-to-the-wire chases, though. Sarah Kaufmann used her five victories during the season to build a nice lead in the Women’s A field and held off hard-charging Kris Walker to claim the season title by just two points – 677-675. Revolution’s Erika Powers and Allison Vrem were third and fourth, respectively, while Canyon Bicycle’s Jessica Morris finished fifth. The sting of Walker’s second-place finish was softened, however, when the physician from Pocatello claimed another age division cyclocross national championship a few weeks later. One of the best stories from the season belonged to the weekly slugfests from Thomas Cooke (X-Men) and Tim Matthews (Church of the Big Ring) in the Masters 35A division. Though Cooke had the upper hand going into the season finale, the death of his father prevented him from lining up for the last race of the year. Matthews competed in that race and, as a result, leapfrogged Cooke into the lead position on season standings. At the awards party, Matthews took his spot on the top step of the podium but grabbed the microphone to invite Cooke to share the spot with him. 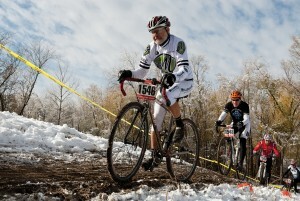 Adrian Rips ran away with the Men’s B field, cruising past RMCC/Cyclesmith’s Kevin Cummiford and UVU’s Pat Terry. The Men’s B had big numbers all season long with 103 riders lining up at one time or another during the season. Chantel Thackery Olsen (Primal Utah) leads Erica Powers (Revolution/Cafe Rio) through the barriers during UTCX # 4 at the Weber County. Photos: Chris See. Find more at fredmarx.photoshelter.com. 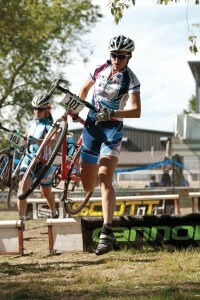 Melanie Smith (Lifetime Fitness) needed every point available to her in the season finale double-points race. 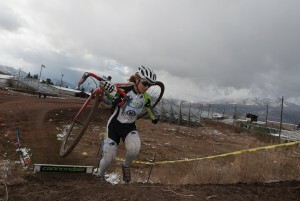 Her victory in that race gave her 606 points – just one more than Bountiful Bicycle’s Erin Davis, who finished second in that race and in the season chase. Jan Holding (Bike Fix) was third. Canyon Bicycle’s Alex Whitney was virtually unbeatable in the Clydesdale division, with victories in 10 of the season’s 12 races. Mark Hooyer finished second and Wesley Rasmussen third. Revolution’s Ryan Ashbridge took the Men’s Singlespeed crown over Big Ring’s Bo Pitkin and Joyride’s Chris Cole. Cutthroat’s Ali Knutson raced consistently and dominated the Women’s Singlespeed with Joyride’s Colleen Tvorik placing second and Revolution’s Jen Hanks rounding out the podium. 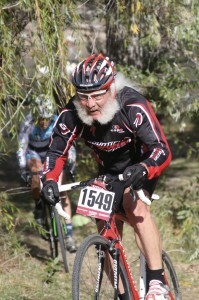 Bob Walker (Bountiful Bicycles) won race 5 at Wheeler Farm and the overall season points series. Photo: Dave Iltis. See more at gallery. cyclingutah.com. The Men’s 45+ field was won by Revolution’s Darren Cottle who used consistent podium finishes to slip past Joyride’s Robert Hamlin and Contender’s Darrell Davis. Bob Walker (Bountiful Bikes) hammered out win after win to claim the Men’s 55+ season crown over Millcreek Bicycle’s Lou Melini and Joyride’s Jeff Kingsford. Lou Melini (Mill Creek) leads Dennis McCormack (Church Of The Big Ring) in Masters 55+ racing in December at UTCX #10 Historic Wheeler Farm. Melini finished the season in second place. Photos: Chris See. Find more at fredmarx.photoshelter.com. Michael Moody (Clammy Chamois) picked up a season title in the Men’s 35B field over Tommy Chandler (Big Ring) and the Joyride duo of Jason Rich and Jason Sparks. Hopping into the fray four races deep into the season, Lifetime Fitness’ Creighton Lowe had little trouble piling up the points in the Men’s C field to win ahead of Animal Liberation’s Joshua Hidalgo and Jared Kirkham. Upgrades will be in order for the 2012 season. Sara Baker followed that formula to claim the Women’s C crowd ahead of Rachel Clayson and Meaghan Buzzard. Paul Solomon and Ryan Clayton teamed up for Welikesmall CC to finish first and second in the Men’s 35C field with Jason Olsen taking third. The juniors saw a lot of action as well with Evan Clouse taking the Boys 11-14 season title and Ian Hansen-Wissbrod as the top racer in the Boys 15-18 category. Charissa Boniface took top honors in the girls junior division.